Microsoft kicked off today’s presser with some footage of Halo 5’s story, and it looks like a blast. 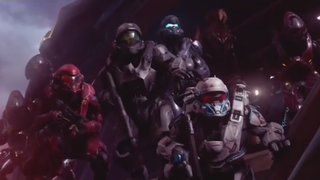 You’ll control two squads: one by Master Chief, and one by Locke, the Spartan that is hunting down the chief. Both will let you experience drop in/drop out 4-player co-op. Microsoft debuted footage of a new multiplayer mode, too: warzone. Halo 5 drops on October 27th, 2015.